I’ve been pretty open in the past about my love for tacos, which has even led to me attempting a column about tacos around RVA (I swear I’m going to do another episode soon). My love is not discriminating–it definitely extends to even the most generic mass-market version of tacos. Plus, I spent most of a decade as a member of a touring punk band, so of course I’ve eaten a ton of Taco Bell in my time. Therefore, when I heard that Taco Bell would be introducing a new breakfast menu late last week, I made it a point to get over there and order some Taco Bell breakfast as soon as I could. I mean, after all, it sells itself. Who can resist the idea of a waffle taco? The question is, though: what does it taste like? I wasn’t sure exactly what I should expect. I’m the sort of person who puts hot sauce on omelettes as a matter of course, so breakfast food done Tex-Mex style is immediately appealing to me, but would Taco Bell really be able to pull it off, or would the result just be a weird hybrid that didn’t really capture the best aspects of either food group? (I’m talking about “breakfast” and “Mexican” here; yes, I know neither of those categories are on the food group chart you learned in elementary school.) The fact that Taco Bell was now offering syrup as a condiment threw me a little bit too. I figured the hot sauce would probably work just fine… right? In the end, there was only one way to find out. The waffle taco was first priority. Priced at $1.99, you can get one with either bacon or sausage. I’m sure some people will have heart attacks when they read this, but I’m not the biggest fan of bacon, so I went with the sausage option. As you can see from the pic above, the waffle taco comes in a McDonald’s-style cardboard carton, which is something I’ve never seen at Taco Bell before. It’s probably because the waffle that forms the taco shell is a bit less flexible than a gordita, and would just flatten out if you tried to wrap it in paper. Tacos are intrinsically messy–the falling-apart-when-you-bite-into-it phenomenon is half the fun of eating them–so I guess they figured it needed all the structural help it could get. Anyway, let’s talk about the taste of this thing. The waffle itself is both greasy (you’ll need napkins, but you always need napkins at Taco Bell, so that’s nothing new) and sweet–not in a cloying way, just as a slight undertone, which is offset by the savory flavor of the sausage. Scrambled eggs and cheese make up the rest of the toppings, and you’re gonna end up with some crumbled eggs on your tray before you finish one of these, so be prepared. I tried both syrup and fire sauce as a topping on the waffle taco, and found syrup actually mixed better with the flavor combo of the taco than the fire sauce did. Regardless of the spicy sausage and the cheddar cheese, Taco Bell’s waffle taco is more like “breakfast” than “Mexican”–which is not to say it tasted bad. I enjoyed it, and would order it again. But it’s not hugely different than the breakfast food you can get at a lot of other American fast food joints. Still–waffle taco! It’ll be a while before that novelty wears off. 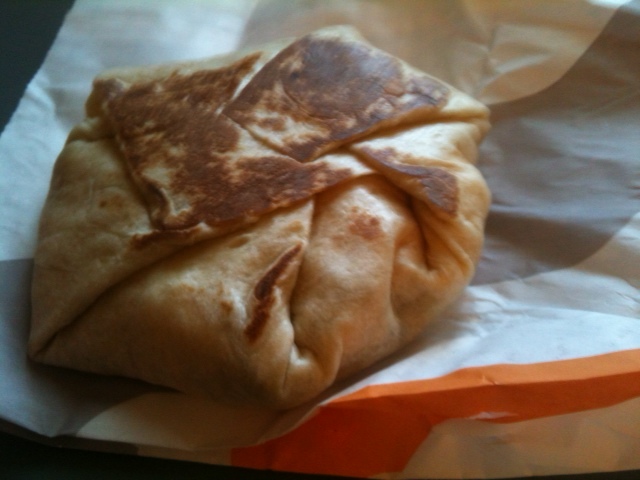 My second choice from the menu was an AM crunchwrap. In addition to the bacon and sausage meat choices, you can also get steak on your crunchwrap for 50 cents more, and that seemed totally worth it to me, so I shelled out the $2.99 for one. This price pushes the steak AM crunchwrap into the area on the Taco Bell menu that I generally think of as “too rich for my blood” (I’m a dollar menu type of guy), but I had to try it. Well, that was a wise decision, because this thing was 100% worth it. The waffle taco may have the novelty value that draws you into a Taco Bell before 11 AM for the first time since you had a job there back in high school, but the reason to stick around is the steak AM crunchwrap. 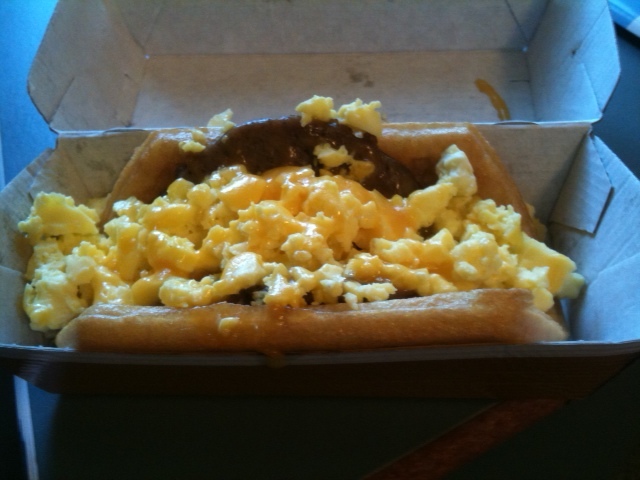 This thing is the crown jewel of Taco Bell’s breakfast menu. Unlike the waffle taco, there’s nothing really sweet about the crunchwrap–the mixture of steak, egg, cheese, and tortilla is all savory and all awesome. I tried the syrup on this thing, but it didn’t really do much for me, and the fire sauce was an infinitely preferable condiment. I tore this damn thing up; it was so good, I kinda wanna get up early tomorrow and go get another one. And I’ll ask for more fire sauce next time, because one packet was not enough by any means. By the way, is there supposed to be a hash brown on this item? I either was so into the other ingredients that I flat-out didn’t notice the potato in the mix, or they didn’t put one on mine. Hopefully it’s the former, and I was just in some kind of food haze nirvana, because if the next one I get is different from the one I had today, I might be bummed. Taco Bell has really only been advertising the two aforementioned items and these weird cinnamon-roll bites that sound just way too sweet for me as being on their new breakfast menu, so I was wondering whether I’d find a very limited selection upon my early-morning visit (hey, 9:30 is early in the morning for me). Not so–there are a variety of other low-profile items on their breakfast menu, including a steak and egg burrito, a sausage flatbread melt, and grilled breakfast tacos. I certainly couldn’t try them all on one visit, but the grilled tacos were only a buck so I got one with sausage on it. 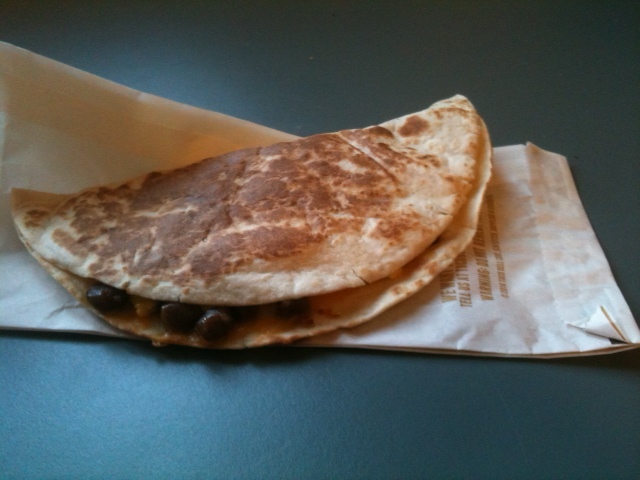 It was really more like a quesadilla than a taco–eggs, cheese, and meat were put together in a soft taco shell, which was then grilled on the same little grill they make the grilled stuft burritos on. Result: tiny quesadilla. And it was tasty enough, but honestly, after the waffle taco and the crunchwrap, I didn’t need any more food. It was all quite a bit more filling than I expected, and I’ll order less food next time. So, overall, would I recommend that you set your alarm and wake up for Taco Bell breakfast food? Well, no, because sleep is always important and, like many adults of my generation, I haven’t regularly eaten breakfast since I moved out of my parents’ house. But if you’re the sort of person who is generally up early and stopping somewhere to grab breakfast on the way in to work, you could do a lot worse than to stop by Taco Bell. The food is at least good, sometimes great, and it’s definitely better than what you can find at McDonalds (Hardees is more debatable). If you’re the sort of person who eats a fruit or drinks a smoothie for breakfast, it’s not for you, but if you’re that sort of person, why are you even reading this article at all?